We’ve had lots of help these days from family and friends visiting the farm. Digging up potatoes, harvesting hops, setting up a waterline to the greenhouse, butchering advice and counselling. It takes a village to grow a farm. Thank you everybody. 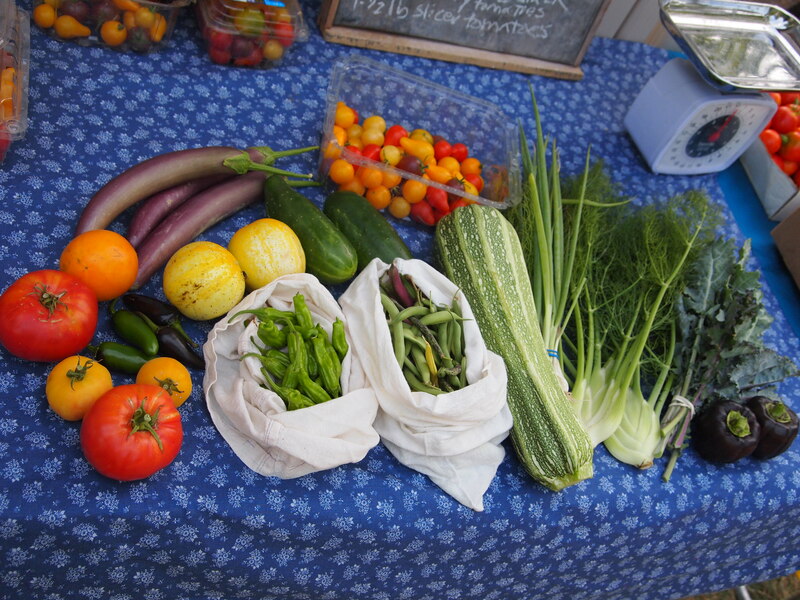 Here is a photo of the CSA share this week. We’re jazzed about including shishito peppers, hope everyone enjoys them as much as we do. And possibly the world’s most petite fennel. Don’t be fooled, they are exceptionally full of flavor. It’s been SO GOOD having our new farm friend, Emily, here this week to help us fumble around. We met Emily briefly at a canning workshop and potluck in Eugene, Oregon last fall. We had shared with her our grand plans to run away and start growing food. She remembered this conversation and this week she decided to take her vacation time and hitch a ride to our little farm in South Dakota. Not exactly a typical vacation destination, infinitely more punkrock – she’s nearly as quirky about growing vegetables as we are. She’s fantastic and we are so grateful to have her happy energy, excellent conversation, and another set of enthusiastic, helping hands in all this weeding and harvesting. Big BIG thanks, Emily! The frost-free hydrant is all set up and flowing in the greenhouse as of last night. 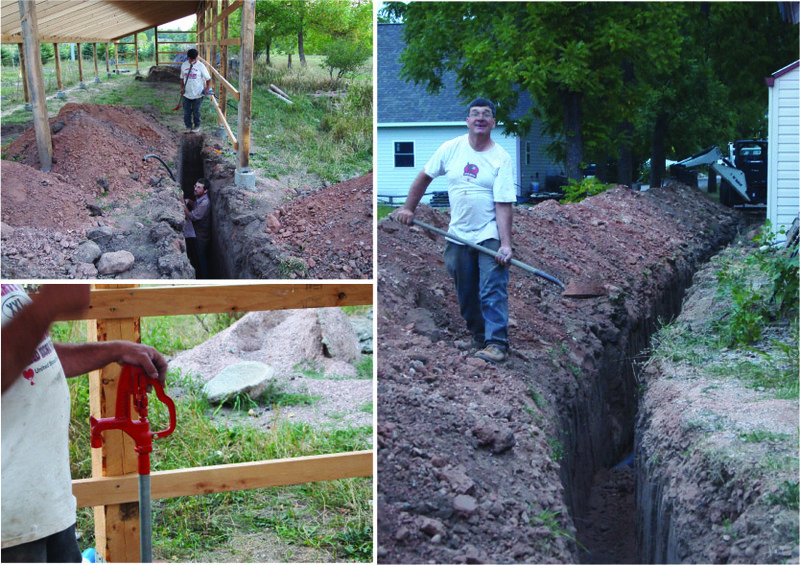 And to take special advantage of the long, deep trench we have dug between the greenhouse and the house-house, we are setting up an earth-tube heat exchange system. This is VERY EXCITING. We’ve written about it in our CSA newsletter this week. Almost quite nearly as exciting as the water hook-up and earth-tube is our fennel. And lastly, here’s a link to a recent article in the Atlantic regarding organic foods for personal health.. vs organic for land health. This entry was posted in farm update and tagged CSA, greenhouse by Cycle Farm. Bookmark the permalink. 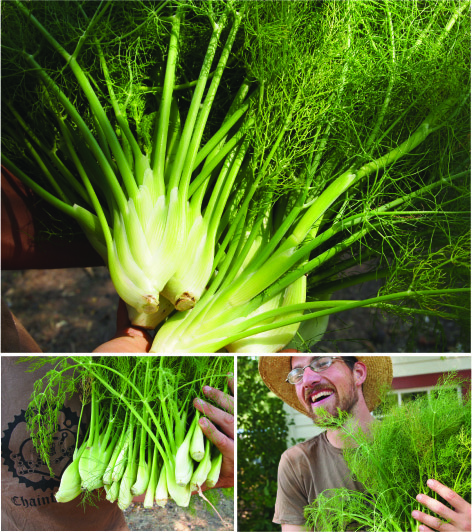 I cannot tell you HOW MUCH I LOVE that photo shoot of fennel fronds & Jeremy. Oh mercy, Regina, ME TOO. Jeremy was SO DANG HAPPY with that bouquet of fennel. I’ve never seen such smiles. This is exactly like a day on the farm. Uncanny. Cycle Farm, directed by RZA. Thank you Thomas.